Happy Memorial Day everyone!!!! I hope all of you (in the states) have enjoyed your weekend and have an awesome Memorial Day planned. 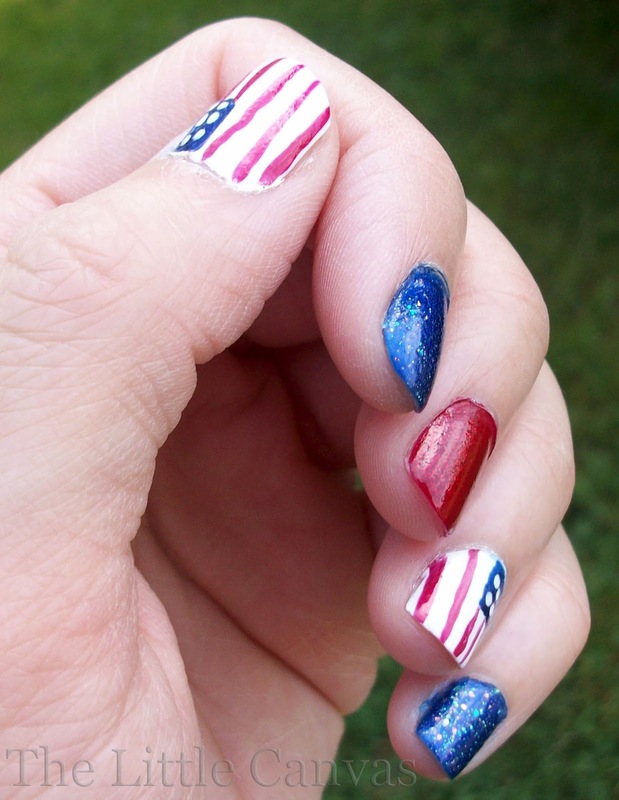 In honor of this holiday, I have a patriotic manicure for you all today! 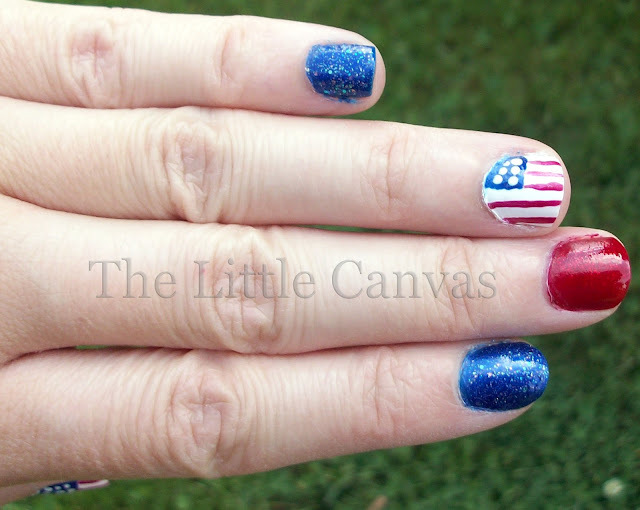 I had a great manicure in mind, but when I sat down to paint, I realized that if I did what I was planning, the flag would have been backwards. This meant I was back to square one. 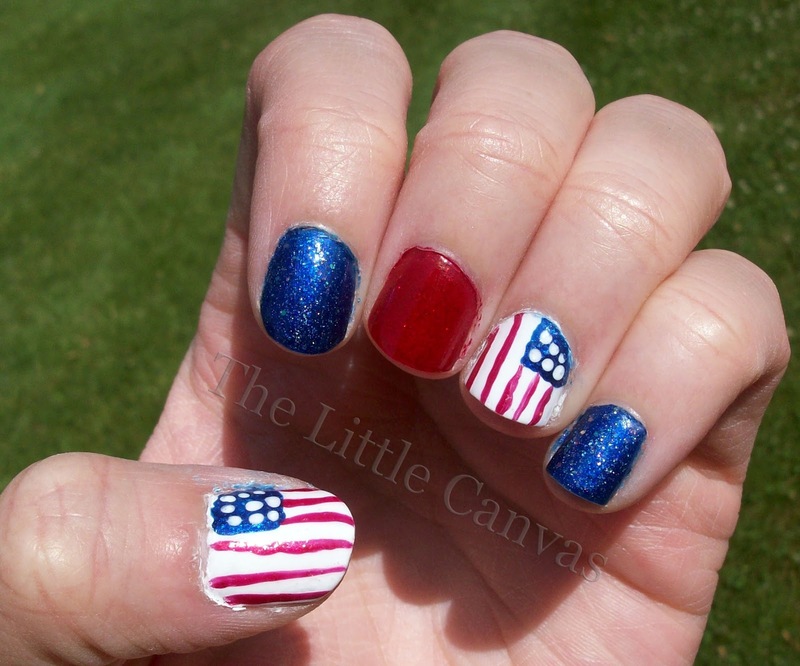 I was talking the other night with @Arlyn531 on Twitter, she tweeted me a picture of her amazing Fourth of July manicure (seriously, click that link), which I fell in love with and in turn had to copy. 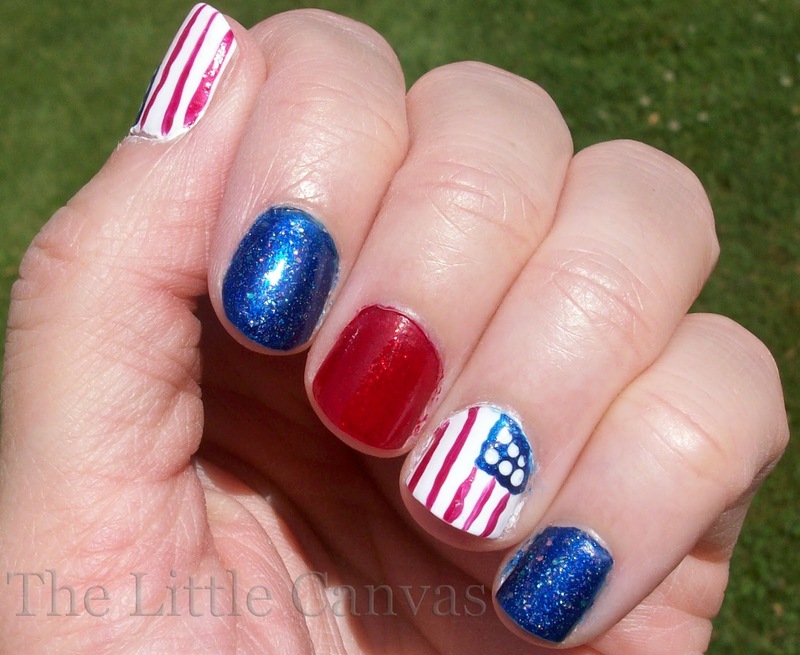 I love how she used rhinestones for the stars! 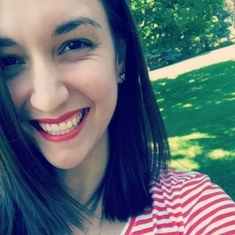 Thank you so much for sharing your picture/design with me! This means that now I'm going to have to come up with something completely original for the Fourth since I hijacked Memorial Day :). I think Miss Arlyn's nails came out better. My stripes aren't 100% straight and I don't have the rhinestones which I'm extremely jealous of. For my blue nails, I wanted them to pop, I did not want them to just be a plain base color, so I added a glitter polish which I didn't really want to purchase in the first place. Boy, am I glad I did, Hottie has quickly become one of my favorite glitters. While this manicure doesn't show it, Hottie a blue glitter polish set in a very sheer jelly blue base. The glitter just shines a whole lot of colors, I really can't explain it. 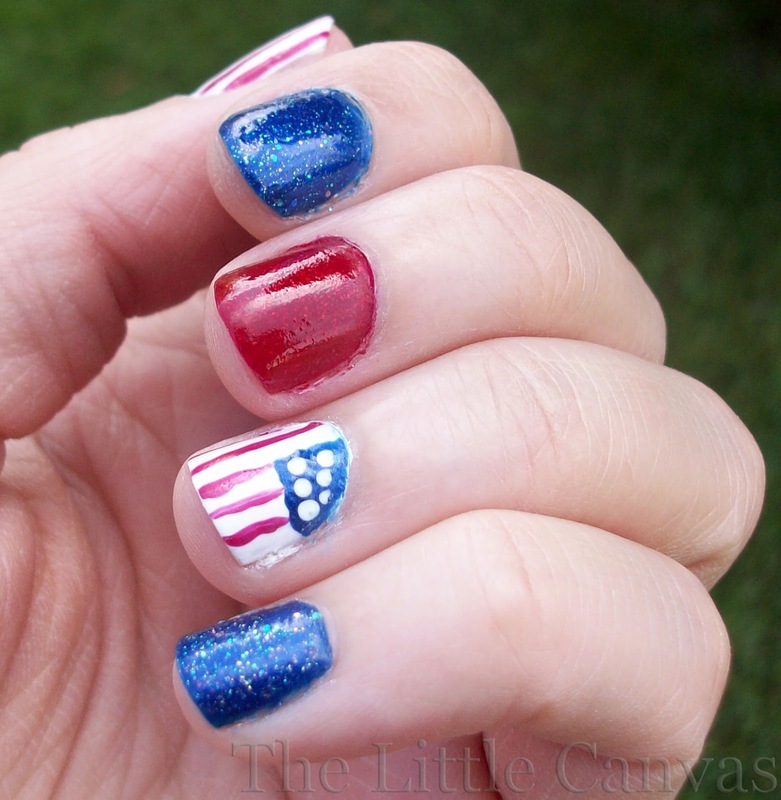 My next manicure I hope will capture it better. Since I was using Hottie on my blue nails, I needed to make sure my red nails stood out. Red Carpet by Sally Hansen is a gorgeous red polish with very fine silver flecks in it. When it is on the nail, it resembles ruby slippers, which I think would have been a much more appropriate name for the polish. The flags were simple and were done with my usual tool, the tooth pick. The lines were done with a striper, and with my shaky hand, they were a bit crooked, but oh well, the flag blowing in the wind isn't perfect. I think it came out perfect. Free handing that stuff is not easy.